The Music Weird originates from the elemental place of music, and attacks all living things. Miniskirt might be the only German-Japanese indiepop band in existence. German singer/songwriter/guitarist Edgar Franz moved to Japan to study and formed Miniskirt with mostly Japanese bandmates. The band's first—and, so far, only—album, Woody Allen Likes Guitar Pop, came out on the German label Marsh-Marigold in 2003. It was reissued in Taiwan on White Wabbit Records with a bonus track in 2005. The band has also contributed a number of songs to compilations. (Their website has a complete discography). For a long time, it seemed as if Miniskirt would be another one of those bands that releases one great record and then disappears. 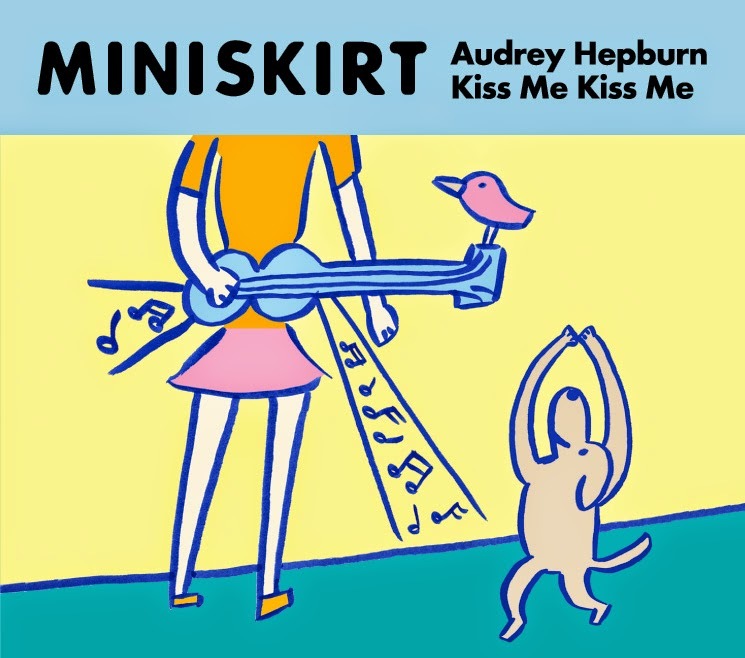 For years, the Miniskirt and Marsh-Marigold websites said that a follow-up album, titled Audrey Hepburn Kiss Me Kiss Me, was "coming soon," but time passed and it never appeared. I contacted Franz to find out what happened to the second album and what Miniskirt is up to today. The interview is from May 21, 2014. Marsh-Marigold said for years that Audrey Hepburn Kiss Me Kiss Me was "coming soon." Yes, it took a while! But now it’s definite. The album will be out in September, and it will be released along with new albums by Alaska and Knabenkraut! Hooray! Did you write all of the songs for the first album in Japan, or did you start working on it when you were still in Germany? I started to write the songs for the first album when I was in Japan. What's the current lineup of Miniskirt? Mai: synthesizer. Sachiko: flute, accordion, vocals. Makiko: bass. Kenmi: drums. Fujihira-san: guitar. Taisuke: guitar. And Edgar: vocals, guitar. Mai, Makiko, and Taisuke were not on the first album. Has Miniskirt been playing live lately? The latest show we played was on 2 November 2013 in Tokyo, together with Sloppy Joe and Poster Boy [Firestation Records] from Hungary. On that day we played with six band members. What kind of reception do you get in Japan? In Japan we get a friendly reception from the indiepop community. We were always lucky to perform at good events together with bands that we liked. Our next show is on August 2nd in Saitama, and again in October in Kyoto. Has J-Pop had any influence on Miniskirt? On the first album, there was no influence of J-Pop, as we were just listening to British guitar-pop bands at that time. After, I started to listen to Japanese Future Pop bands like Aprils and EeL, with whom we also played some shows together, Mai joined the band to add some synthesizer to our sound. Therefore, the inclusion of a synthesizer is the only J-Pop influence, although Mai herself prefers to listen to Stereolab. When Sachiko is singing on some songs, her Japanese accent makes them sound as much Japanese as German because of my voice. Do you think you'll ever write a song in Japanese? Never say never. Yes, I plan to write lyrics in Japanese. Can you tell us more about the new album and when it will be out? No further delays. It will be out in September. It’s a great album. Everyone on planet Earth should own a copy. It’s pure guitar pop. Two songs are in German, the other 10 songs in English. The lyrics are full of references to personalities that we cherish, like John Wayne, Tintin, and the Smiths. The cover design is by the legendary Jad Fair. Are any of the members of Miniskirt active in other bands? At the moment everyone is just playing with Miniskirt! What else are you doing these days? You wrote a book on Philipp Franz von Siebold—are you working on another book? In the last few years I have continued my research on the history of German-Japanese relations and published several essays in Japanese university journals. In cooperation with a Japanese colleague, I have translated two books on German history from German to Japanese. Currently, I am working on a film script. In summer I will attend a workshop in high-def filmmaking given by the New York Film Academy. Welcome to the omni-audient tympanum of the universe. Greg Adams wrote for the All-Music Guide for 10 years and has written liner notes for and/or produced over 80 reissue CDs for labels such as Eric Records, Bear Family, Varese Sarabande, Real Gone, Collectors' Choice Music, and Omni Recording Co. His writing has appeared on Billboard.com, MS-NBC Entertainment, and other music and entertainment websites. What are the lyrics to "Hallelujah Anyhow"? © 2014 Greg Adams. Watermark theme. Powered by Blogger.